The Lament for Ur, or Lamentation over the city of Ur is a Sumerian lament composed around the time of the fall of Ur to the Elamites and the end of the city's third dynasty (c. 2000 BC). It contains one of five known Mesopotamian "city laments"—dirges for ruined cities in the voice of the city's tutelary goddess. The Book of Lamentations of the Old Testament, which bewails the destruction of Jerusalem by Nebuchadnezzar II of Babylon in the sixth century B.C., is similar in style and theme to these earlier Mesopotamian laments. Similar laments can be found in the Book of Jeremiah, the Book of Ezekiel and the Book of Psalms, Psalm 137 (Psalms 137:1-9), a song covered by Boney M in 1978 as Rivers of Babylon. The first lines of the lament were discovered on the University of Pennsylvania Museum of Archaeology and Anthropology catalogue of the Babylonian section, tablet numbers 2204, 2270, 2302 and 19751 from their excavations at the temple library at Nippur. These were translated by George Aaron Barton in 1918 and first published as "Sumerian religious texts" in Miscellaneous Babylonian Inscriptions, number six, entitled "A prayer for the city of Ur". The restored tablet is 9 by 4.5 by 1.75 inches (22.9 by 11.4 by 4.4 cm) at its thickest point. Barton noted that "from the portions that can be translated it appears to be a prayer for the city of Ur at a time of great danger and distress. It seems impossible to assign it with certainty to any particular period." He noted that it was plausible but unconfirmed to conjecture that it "was written in the last days of Ibbi-Sin when Ur was tottering to its fall". Edward Chiera published other tablets CBS 3878, 6889, 6905, 7975, 8079, 10227, 13911 and 14110 in "Sumerian texts of varied contents" in 1934, which combined with tablets CBS 3901, 3927, 8023, 9316, 11078 and 14234 to further restore the myth, calling it a "Lamentation over the city of Ur". A further tablet source of the myth is held by the Louvre in Paris, number AO 6446. Others are held in the Ashmolean, Oxford, numbers 1932,415, 1932,522, 1932,526j and 1932,526o. Further tablets were found to be part of the myth in the Hilprecht collection at the University of Jena, Germany, numbers 1426, 1427, 1452, 1575, 1579, 1487, 1510 and 1553. More fragments are held at the Musée d'Art et d'Histoire (Geneva) in Switzerland, MAH 15861 and MAH 16015. Other translations were made from tablets in the Nippur collection of the Museum of the Ancient Orient in Istanbul (Ni). Samuel Noah Kramer amongst others worked to translate several others from the Istanbul collection including Ni 4496, 1162, 2401, 2510, 2518, 2780, 2911, 3166, 4024, 4424, 4429, 4459, 4474, 4566, 9586, 9599, 9623, 9822 and 9969. Other tablets from the Istanbul collection, numbers Ni 2510 and 2518 were translated by Edward Chiera in 1924 in "Sumerian religious texts". Sir Charles Leonard Woolley unearthed more tablets at Ur contained in the "Ur excavations texts" from 1928. Other tablets are held in the Vorderasiatisches Museum Berlin and the Yale Babylonian collection. Samuel Noah Kramer compiled twenty-two different fragments into the first complete edition of the Lament, which was published in 1940 by the University of Chicago as Lamentation over the Destruction of Ur (Assyriological Study no. 12). Other tablets and versions were used to bring the myth to its present form with a composite text by Miguel Civil produced in 1989 and latest translations by Thorkild Jacobsen in 1987 and Joachim Krecher in 1996. 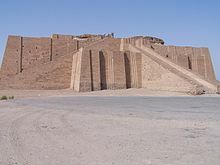 Various buildings are noted to be destroyed in Enlil's storm, including the shrines of Agrun-kug and Egal-mah, the Ekur (the sanctuary of Enlil), the Iri-kug, the Eridug and the Unug. The destruction of the E-kic-nu-jal is described in detail. The destruction of the location is reported to Enlil, and his consort Ninlil, who are praised and exalted at the end of the myth. The devastation of cities and settlements by natural disasters and invaders has been used widely throughout the history of literature since the end of the Third Dynasty of Ur. A stela (pictured) from Iraq depicts a similar destruction of a mountain house at Susa. Michelle Breyer suggested tribes of neighbouring shepherds destroyed the city and called Ur, "the last great city to fall". Jacobsen, Thorkild., The Harps that Once .. Sumerian Poetry in Translation. New Haven/London: Yale University Press. 151-166. 1987. Klein, Jacob., "Sumerian Canonical Compositions. A. Divine Focus. 4. Lamentations: Lamentation over the Destruction of Sumer and Ur (1.166)". In The Context of Scripture, I: Canonical Compositions from the Biblical World. Hallo, William W. (ed). Leiden/New York/Köln: Brill. 535-539. 1997. Kramer, Samuel Noah., Lamentation Over the Destruction of Ur. Assyriological Studies 12. Chicago, IL: Chicago University Press. 1940. Rosengarten, Yvonne., Trois Aspects de la Pensée Religieuse Sumérienne. Paris: Editions De Boccard. 1971. Witzel, Maurus., "Die Klage über Ur". In Orientalia 14. Rome 185-234. 1945. Witzel, Maurus. 1946., "Die Klage über Ur". In Orientalia 15. Rome 46-63. 1945. ^ Victor Harold Matthews; Don C. Benjamin (2006). Old Testament parallels: laws and stories from the ancient Near East. Paulist Press. pp. 248–. ISBN 978-0-8091-4435-8. Retrieved 4 June 2011. ^ a b George Aaron Barton (1918). Miscellaneous Babylonian inscriptions, p. 45. Yale University Press. Retrieved 23 May 2011. ^ Edward Chiera; Samuel Noah Kramer; University of Pennsylvania. University Museum. Babylonian Section (1934). Sumerian texts of varied contents, p. 1-. The University of Chicago Press. Retrieved 3 June 2011. ^ Musée du Louvre. Département des antiquités orientales et de la céramique antique; Musée du Louvre. Département des antiquités orientales. Textes cunéiformes, 16, 40. Librairie orientaliste, Paul Geuthner. ^ Ashmolean Museum (1976). Oxford Editions of Cuneiform Texts, 12, 13, 14 and 15. Oxford University Press. ^ Universität. Jena. Frau Professor Hilprecht Collection of Babylonian Antiquities. Texte und Materialien der Frau-Professor-Hilprecht-Collection of Babylonian antiquities: Neue Folge, 4 18, 4 19, 4 21, 4 20, 4 22, 4 23, 4 24 and 4 25. Hinrichs. Retrieved 4 June 2011. ^ University of Chicago. Dept. of Oriental Languages and Literatures (1970). Journal of Near Eastern studies, pl. 1 and 2. Univ. of Chicago Press. ^ Samuel Noah Kramer (1944). Sumerian literary texts from Nippur: in the Museum of the Ancient Orient at Istanbul, 32, 45, 94, 95, 96, 97, 98 and 99. American Schools of Oriental Research. Retrieved 28 May 2011. ^ Muazzez Cig; Hatice Kizilyay (1969). Sumerian literary tablets and fragments in the archeological museum of Istanbul-I, 81, 95, 100, 107, 115, 118, 139, 142 and 147. Tarih Kurumu Basimevi. Retrieved 28 May 2011. ^ Edward Chiera; Constantinople. Musée impérial ottoman (1924). Sumerian religious texts, 32 & 45. University. Retrieved 23 May 2011. ^ British museum and Pennsylvania University. University museum. Joint expedition to Mesopotamia; Pennsylvania University. University museum (1928). Ur excavations texts... 6 137, 6 135, 6 136, 6 137, 6 138, 6 139, 6 *290. British museum. Retrieved 28 May 2011. ^ Königliche Museen zu Berlin. Vorderasiatische Abteilung; Heinrich Zimmern; Otto Schroeder; H. H. Figulla; Wilhelm Förtsch; Friedrich Delitzsch. Vorderasiatische Schriftdenkmäler 10, 141. Louis D. Levine. Retrieved 4 June 2011. ^ a b c d e The Lament for Ur., Black, J.A., Cunningham, G., Robson, E., and Zólyomi, G., The Electronic Text Corpus of Sumerian Literature, Oxford 1998-. ^ a b Dale Launderville (2003). Piety and politics: the dynamics of royal authority in Homeric Greece, biblical Israel, and old Babylonian Mesopotamia. Wm. B. Eerdmans Publishing. pp. 248–. ISBN 978-0-8028-3994-7. Retrieved 4 June 2011. ^ Kenneth R. Wade (February 2004). Journey to Moriah: The Untold Story of How Abraham Became the Friend of God. Pacific Press Publishing. pp. 21–. ISBN 978-0-8163-2024-0. Retrieved 4 June 2011. ^ a b J. Harold Ellens; Deborah L. Ellens; Rolf P. Knierim; Isaac Kalimi (2004). God's Word for Our World: Biblical studies in honor of Simon John De Vries. Continuum International Publishing Group. pp. 287–. ISBN 978-0-8264-6974-8. Retrieved 4 June 2011. ^ Karen Weisman (6 June 2010). The Oxford handbook of the elegy. Oxford University Press. pp. 75–. ISBN 978-0-19-922813-3. Retrieved 4 June 2011. ^ Institut orientaliste de Louvain (1977). Orientalia Lovaniensia periodica. Instituut voor Oriëntalistiek. Retrieved 4 June 2011. ^ a b Piotr Michalowski (1989). The lamentation over the destruction of Sumer and Ur. Eisenbrauns. pp. 4–. ISBN 978-0-931464-43-0. Retrieved 4 June 2011. ^ Sabrina P. Ramet (1996). Gender reversals and gender cultures: anthropological and historical perspectives. Psychology Press. pp. 58–. ISBN 978-0-415-11482-0. Retrieved 4 June 2011. ^ Philip S. Alexander (1 December 2007). The Targum of Lamentations. Liturgical Press. pp. 26–. ISBN 978-0-8146-5864-2. Retrieved 4 June 2011. ^ Peter G. Tsouras (24 October 2005). The Book of Military Quotations. Zenith Imprint. pp. 12–. ISBN 978-0-7603-2340-3. Retrieved 4 June 2011. ^ Michelle Breyer (December 1997). Ancient Middle East. Teacher Created Resources. pp. 41–. ISBN 978-1-55734-573-8. Retrieved 4 June 2011.